The effects of two regulated deficit-irrigation (RDI) strategies pre- and postveraison on soil-plant water relations and their influence on leaf area development, cluster microclimate, yield, and berry quality were evaluated during two years in field-grown Monastrell grapevines under semiarid conditions in southeastern Spain. Three treatments were applied. The control was irrigated at 60% ETc (crop evapotranspiration), or 319 mm water over the full season. Regulated deficit-irrigation treatment 1 (RDI-1) received the same irrigation as the control before fruit set, 30% ETc from fruit set to harvest, and 45% ETc postharvest. Regulated deficit-irrigation treatment 2 (RDI-2) was the same as RDI-1, but with 15% ETc from fruit set to harvest. RDI-1 maintained soil water content and vine water status adequate for sustaining leaf gas exchange, without affecting sugar accumulation or increasing polyphenols at harvest. Moreover, RDI-1 reduced yield and berry size and improved cluster microclimate by reducing leaf area and increased water use efficiency. However, RDI-2 suffered more stress, mainly postveraison. This severe water stress substantially reduced root-vine hydraulic conductance and leaf gas exchange, decreasing gas exchange efficiency, leaf nitrogen, and chlorophyll content. Excessive postveraison water stress advanced leaf abscission, reducing leaf area development and yield. Lower leaf photosynthesis and higher leaf abscission significantly decreased yield and sugar in RDI-2 berries compared with RDI-1. Polyphenol and anthocyanin content also decreased significantly in RDI-2 compared with RDI-1. To avoid severe root and leaf function damage and increase polyphenols in this cultivar, we identified optimum physiological thresholds for several vine water indicators pre- and postveraison. Irrigation management is the largest, most controllable determinant of grape and wine quality in arid areas (Fereres and Evans 2006). One of the most promising irrigation-management techniques for vineyards in semiarid areas is regulated deficit irrigation (RDI) (McCarthy et al. 2002, Kriedemann and Goodwin 2003, Keller 2005, Chaves et al. 2007). The effect of RDI depends on vine phenological stage and the severity of the stress imposed (McCarthy et al. 2002). RDI in winegrapes is commonly applied during two periods to increase berry quality. Water deficits early in the season, from fruit set to veraison (preveraison), control berry size and reduce vine vigor (McCarthy et al. 2002, Keller 2005). Water deficits after veraison, during fruit ripening, increase the biosynthesis of anthocyanins and other phenolic compounds (Kennedy et al. 2002). Both practices can reduce yield and vegetative development compared to full irrigation (Kriedemann and Goodwin 2003) and can benefit berry and wine quality in different ways (McCarthy et al. 2002, Cortell et al. 2005, 2007). A disadvantage of RDI is that it requires water status to be maintained within a narrow tolerance range. Overirrigation undermines the advantages of RDI and increases water use, while underirrigation can lead to severe yield or quality losses (Jones 2004). Thus, efficient scheduling of RDI requires defining several threshold values for plant stress indicators, beyond which irrigation is necessary to avoid deleterious effects on vines and to achieve specific objectives in crop management. However, the variable responses of different cultivars to different climatic conditions and water stress levels make it difficult to use only one indicator for vine water status or irrigation scheduling. A common and practical indicator used in grapevine to manage irrigation is water potential, measured as predawn leaf water potential, stem water potential at midday or mid-morning (Keller et al. 2008), or leaf water potential (Shellie 2006). However, there is some disagreement concerning whether stem or leaf water potential is better correlated to vine physiology and concerning which time of day best reflects vine performance (Baeza et al. 2007). In isohydric species such as some grapevine cultivars, leaf water status is stable over a wide range of soil water potentials (Schulze 2003). In these instances, water potential or other tissue water status indicators cannot be used as a sensitive measure of water stress (Jones 2004, 2007). Recent results indicate that leaf water potential is a good indicator of both vine water status and agronomic response, but not of must composition (Baeza et al. 2007). At present, there is little definitive information about the relationship between different vine water status parameters and berry composition, particularly phenolic composition (Sousa et al. 2006, Keller et al. 2008). An optimum threshold for stomatal conductance (gs) between 0.05 and 0.15 mol m−2 s−1 was suggested to increase water use efficiency in grapevines (Cifre et al. 2005), but investigators did not study the relationship between leaf photosynthesis, gs, or other physiological parameters and berry composition. Here we describe the effects of RDI on some important physiological processes and their influence on berry composition, particularly of phenolics. Over two years, two different RDI strategies were applied pre- and postveraison to achieve three objectives traditionally related to increased berry and wine quality: (1) to control excessive vegetative development, (2) to reduce berry size, and (3) to stimulate the direct accumulation of anthocyanins and other phenolic compounds by postveraison water deficit. The study focused on finding significant relationships between physiological indicators and berry composition under RDI and identifying the threshold limits or vine-specific optimums of these indicators during different phenological stages to maximize berry phenolic composition at harvest. We studied the soil water status, leaf function, leaf area, and cluster microclimate and their relationships to berry composition under different water stress severity pre- and postveraison. The aim was to identify physiological thresholds for efficient long-term RDI strategies for premium red wines and to improve water use efficiency under semiarid conditions. Field conditions, plants, and irrigation treatments. This research was carried out from 2006 to 2007 at the CIFEA experimental station in Jumilla, Murcia (southeastern Spain) (lat. 38°23′40″N; long. 1°25′30″W; 350 m asl). The soil was a 60 cm deep fine clay (48% clay, 30% silt, 22% sand), with 1.36% organic matter, 18.8% active CaCO3, ECsat (electrical conductivity) 5.04 dS m−1, and pH 7.6. The irrigation well water had ECsat 1.6 dS m−1. The climate was semiarid Mediterranean, with hot dry summers and daily maximum summer temperatures ~38 to 39°C. There are 12 to 14 days per summer of extreme heat (>35°C), mainly in July and August. Annual rainfall at the experimental site was 285 mm in 2006 and 287 mm in 2007, mainly in the spring and fall, and the total annual reference evapotranspiration (ETo) was 1248 mm in 2006 and 1250 mm in 2007 (Table 1⇓). Climate measures during different phenological stages, 2006 to 2007. The study was performed on 12-year-old Vitis vinifera L. Monastrell (syn. Mourvedre) red wine grapevines grafted onto 1103 Paulsen rootstock and planted in 1997. A bilateral cordon training system trellised to a three-wire vertical system was used. Vine rows ran N-NW to S-SE, and planting density was 2.5 m between rows and 1.25 m between vines (3200 vines/ha). Six 2-bud spurs (12 nodes) per vine were retained at pruning. In May, green nonproductive shoots were removed from each vine according to local grower practice. Three different irrigation treatments were applied during two consecutive years (2006–2007). The control treatment was irrigated at 60% crop evapotranspiration (ETc) throughout the season (319 mm/year). Regulated deficit-irrigation treatment 1 (RDI-1) received 30% ETc while RDI treatment 2 (RDI-2) received 15% ETc. In RDI treatments, irrigation reduction was applied from fruit set (pea-size berries; treatments initiated on 7 June in 2006 and 6 June in 2007) until harvest (15 Sept in 2006 and 26 Sept in 2007), coinciding with phases I, II, and III of berry growth and development. A recovery of irrigation at 45% ETc was applied in the RDI treatments from harvest to leaf fall (end of October). The mean annual irrigation water applied was 207 mm in RDI-1 and 156 mm in RDI-2. ETc was estimated using varying crop coefficients (kc) (ETc = ETo x kc) based on those proposed by the FAO and adjusted for the Mediterranean area and ETo values. The ETo was calculated weekly from the mean values of the preceding 6 to 7 years using the Penman-Monteith–FAO method (Allen et al. 1998) and the daily climate data collected in the meteorological station located at the experimental vineyard. The applied kc values were 0.35 in April, 0.45 in May, 0.5 in June, 0.75 in July to mid-August, 0.60 for the end of August to mid-September, and 0.45 for mid-September to the end of October. Each treatment was replicated four times in a completely randomized, four-plot design. Each replicate consisted of 164 vines. Irrigation was applied three to five times per week, depending on the phenological period, and was controlled automatically. All treatments received the same annual application of fertilizer: 40 kg N, 20 kg P, 60 kg K, and 16 kg Mg/ha, and 1.6 g Fe chelate per vine, supplied through the irrigation system. The amount of water applied in each treatment was measured with flow meters. Water was applied by one pressure-compensated emitter per plant (4 L h−1) in one drip-irrigation line per row. Drip-irrigation lines were placed ~40 cm aboveground. Volumetric soil water content (𝛉v) was measured three to four times per week in 2006 and 2007 over the course of the experiment with a Diviner 2000 portable soil moisture probe (Sentek, Stepney, Australia). One-meter single PVC access tubes were installed to a 70 cm depth in one side of the root zone. Readings were taken 10 to 15 cm from the drip head and oriented perpendicularly to the vine row at 10 to 70 cm depths. Scaled frequencies were converted to 𝛉v using a capacitance probe calibration equation for similarly textured clay soil, as proposed elsewhere (Rose et al. 2001): V = 47.38 SF3.12, r = 0.93. Vine water status and leaf gas exchange. Each year, midday stem water potential (Ψs) was determined weekly from the beginning of vegetative growth until leaf fall. Eight fully exposed and expanded mature leaves were taken per treatment (two leaves per plot). The leaves were enclosed within aluminium foil-covered plastic at least 2 hr before the midday measurement. The Ψs was measured at midday (12:00–14:00 hr) using a pressure chamber (model 3000; Soil Moisture Equipment, Santa Barbara, CA). Relative water content (RWC) was obtained under the same conditions as Ψs. Rehydration was carried out by submerging leaf petioles in distilled water for 24 hr in the dark at 4°C. RWC was calculated using the equation RWC (%) = [(fw − dw)/(tw − dw)] × 100, in which fw, dw, and tw refer to fresh, dry, and turgid weight, respectively. Dry weight was calculated after drying the leaves to constant weight in an oven at 65°C for 48 hr. Gas exchange was measured between 09:00 and 11:00 hr every 7 to 14 days from April to October in 2006 and 2007 on selected clear days. Measurements were made on healthy, fully expanded mature leaves exposed to the sun (one leaf on each of 12 vines per treatment), from main shoots located on the exterior canopy. The leaf photosynthesis rate (A), gs, and transpiration rate (E) were measured with a portable LI-6400 photosynthesis measurement system (LI-COR, Lincoln, NE) equipped with a broadleaf chamber (6.0 cm2). During measurements, leaf chamber temperature was maintained between 25 and 32°C, leaf to air vapor pressure deficit (VPDl) at 2.0 ± 0.5 kPa, and relative humidity at 40 to 50%. Molar air flow rate inside the leaf chamber was 350 μmol mol−1. All measurements were taken at a reference CO2 concentration similar to ambient (380 μmol mol−1) and at a saturating photosynthetic photon flux of 1500 μmol m−2 s−1, by using a red/blue light source (6400-02B LED) attached to the leaf chamber. Leaf nitrogen and chlorophyll content. For chlorophyll analysis, 12 fully expanded leaves per treatment were sampled (on three vines per treatment per plot) during pre- and postveraison periods in 2006. Chlorophyll concentration was determined spectrophotometrically at 647 and 664.5 nm after extraction in 80% acetone. Chlorophyll concentration was calculated as previously described (Inskeep and Bloom 1985). Total nitrogen was measured using a LECO FP-528 elemental analyzer (LECO Corp., St Joseph, MI) both preveraison (2–23 July) and postveraison (1 August) in 2006 and 2007. Twelve leaves per treatment (three leaves per plot) were analyzed. where Emd is the maximum transpiration rate and Ψsoil − Ψlmin are soil and minimum diurnal leaf water potential, respectively. Predawn leaf water potential (Ψpd), measured before sunrise in unbagged leaves, was assumed to be in equilibrium with the soil water potential (Richter 1997). In this condition, Ψsoil is equivalent to the predawn leaf water potential. Thus (Ψpd − Ψlmin) represents the driving force for the water flow from the soil to the leaf, and Kplant is the ratio of the flow through the plant to the driving force for the flow (Lo Gullo et al. 2003). Maximum values for E and minimum values for Ψlmin (measured between 12:00–17:00) were used to calculate Kplant, because under these conditions plants are likely to have transpired all stored water so that steady-state flows are likely to be established. Kplant was then scaled to the total leaf area of the vine. where Ψs is the midday stem water potential and Ψsoil is predawn leaf water potential. Leaf area per vine was estimated preveraison, postveraison, and at leaf fall in 16 vines per treatment (four per plot) using a nondestructive method. The leaves from main and lateral shoots were separated and measured using a LI-3000 leaf area meter (LI-COR). Initially, the single leaf area of randomly selected leaves (12 shoots per treatment, ~200 leaves) was estimated by developing a polynomial equation relating main vein length (L) to leaf area (LA) (LA = 22.10L − 89.44, r2 = 0.89, p < 0.001, for main shoots and LA = 18.39L − 51.04, r2 = 0.74, p < 0.001 for lateral shoots). One representative shoot per vine (16 shoots per treatment) was chosen for leaf area measurements. Leaf area per vine was estimated by multiplying the average shoot leaf area by the number of shoots on the vine. Bunch exposure and cluster microclimate. Berry temperature was determined on clear sunny days in sunlight- exposed (east facing) and nonexposed bunches (inside the canopy at the cluster zone) at two times during the day: early morning (8:00–10:00 hr) and afternoon (13:00–15:00 hr) at veraison and after veraison. Berry temperature was measured in 20 vines per treatment (two representative bunches per vine) using a Testo 845 infrared thermometer (Testo, Lenzkirch, Germany). Light in the cluster zone (as incident photosynthetically active radiation [PAR], 400 to 700 nm) was measured inside the canopy, close to fruiting positions and on both sides of the vine during midday on sunny days, pre- and postveraison. In each vine, four determinations were made. The same vines chosen for berry temperature measurements were also used for light measurements in the fruit zone. Readings were taken on the face of clusters facing east-west, using a LI-190 SA external quantum sensor connected to a Li-250A light meter (LI-COR). Yield response and berry quality. Yield components (crop load and number of bunches) were measured at harvest on 52 vines per treatment (13 vines per plot). To determine berry composition at harvest, five to six berries from randomly selected clusters were sampled from the same vines used for yield component analysis. A randomly selected subsample was collected for must analysis. The weight of 100 berries was determined in each subsample to estimate mean fresh berry weight. Total soluble solids (TSS) (Brix) was determined using an Atago RX-5000 digital refractrometer (Atago, Tokyo, Japan). Juice pH and titratable acidity (TA) were determined by titration with 0.1 N NaOH using a Metrohm 686 automatic titrator (Metrohm, Herisau, Switzerland). Malic and tartaric acids were analyzed using enzymatic kits from Boehringer Mannheim GmbH (Mannheim, Germany). Anthocyanins were determined as described (Saint-Cricq et al. 1998) by macerating the grapes for 4 hr at pH 3.6 or 1.0. The total and extractable anthocyanin content of the two solutions was then chemically assayed by measuring absorbance at 520 nm at pH 1.0 and pH 3.6, respectively, while the total phenol content was calculated by measuring the optical density of the solution at pH 3.6 at 280 nm. The data were analyzed using analysis of variance (ANOVA) and means were separated by Duncan’s multiple range test using StatGraphics 2.0 Plus software. Linear and nonlinear regressions were fitted using SigmaPlot 2000 (Systat, Richmond, CA). Schwarz’s Bayesian criterion index (SBC) was used to find the best fit for nonlinear regression between parameters. Maximum and threshold values were calculated using these fitted equations. Soil water status and root-plant hydraulic conductivity. The reduction of irrigation after fruit set produced a decrease in the soil water content (𝛉V) in the root zone. In both years from fruit set to harvest, RDI-2 had significantly lower 𝛉v than the control and RDI-1 (Table 2⇓). However, RDI-1 maintained 𝛉v values that were not significantly different from the control during postveraison in 2006 and 2007 and during preveraison in 2006. During the months immediately after harvest, no significant differences in 𝛉v were observed between RDI treatments and the control. Mean volumetric soil water content (𝛉v) (%) in the highest fine root density zone (0–30 cm) for each treatment at four representative periods, 2006 and 2007. Whole plant hydraulic conductance (Kplant) and root to stem hydraulic conductance (Kroot-stem) were similar among treatments prior to water stress (May) and following harvest (September), but decreased significantly in RDI treatments during water stress (Table 3⇓). RDI-2 had significantly lower Kplant and Kroot-stem than RDI-1 postveraison. There was a close, significant linear relationship among Kplant, Kroot-stem, and Ψs (Figure 1⇓). Mean values of whole plant hydraulic conductance (Kplant: g MPa−1 s−1) and hydraulic conductance from root to stem(Kroot-stem: g MPa−1 m−2 s−1) for each treatment in different phenological stages, 2006. Relationship between midday stem water potential (Ψs) and (A) whole plant hydraulic conductance (Kplant) during pre- and postveraison (Kplant = 0.88 + 0.55 Ψs) and (B) root to stem hydraulic conductance (Kroot-stem) (Kroot-stem = 0.23 + 0.14 Ψs) in 2006. Vine water status and leaf function. In both years, from budburst to fruit set (full irrigated conditions), Ψs and RWC were greater than -1 MPa and 94%, respectively, in all treatments (Figure 2A, B⇓). In 2006, when soil water deficits were applied after fruit set (phase I of fast fruit growth period), Ψs decreased significantly in RDI-2 vines compared to the control. However, in 2007, after only three days of irrigation reduction, Ψs decreased significantly in all RDI vines. Mean Ψs decreased progressively during all phase I, reaching minimum values at the end of the phase (end of July). In 2007, leaf RWC was significantly lower at the end of phase 1 in RDI vines than in control vines. 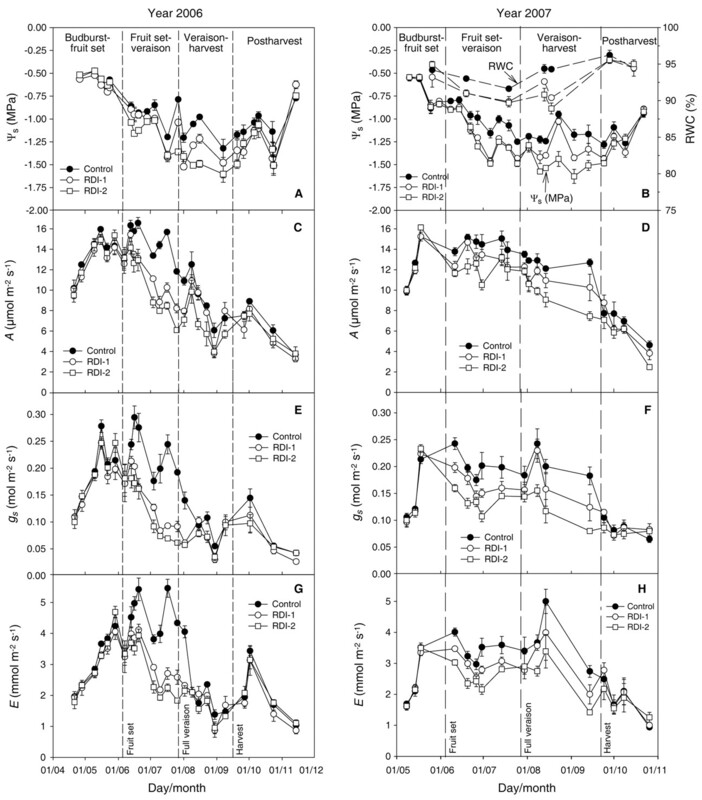 Seasonal patterns during 2006 and 2007 of (A, B) midday stem water potential (Ψs) and leaf relative water content (RWC); (C, D) leaf photosynthesis rate (A); (E, F) stomatal conductance to water vapor (gs); and (G, H) transpiration rate (E). Vertical bars indicate the standard error of the mean. Each point is the average of eight measurements for Ψs and RWC and 12 measurements for gas exchange parameters. Leaf gas exchange was also significantly reduced in RDI vines in phase I in both years (Figure 2C–H⇑). Only six or seven days after irrigation was reduced in phase I, significant reductions in gs and E were observed among the treatments. Thus, in 2007, average values of A during phase I were reduced 11% in RDI-1 and 19% in RDI-2 compared with the control. 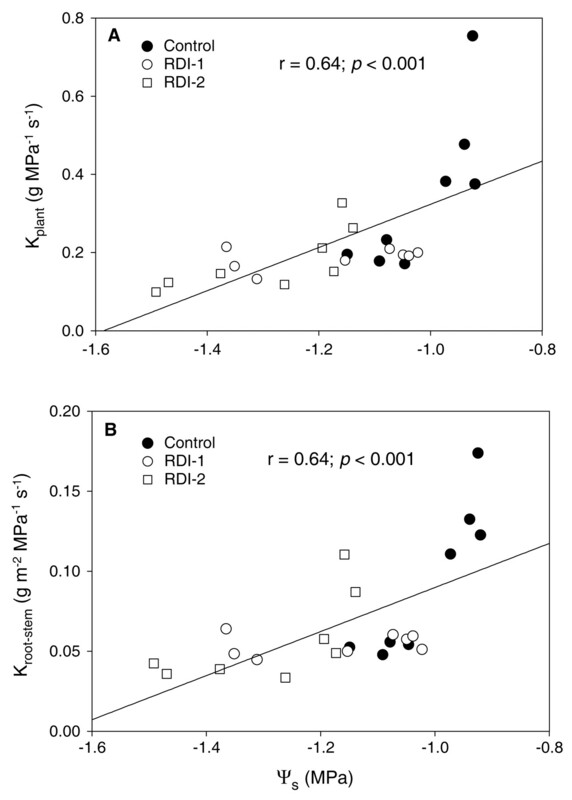 However, stomatal closure (gs) was further reduced by water stress by 22% and 35% in RDI -1 and RDI-2, respectively (Figure 2F⇑). The differences between RDI treatments were accentuated during water stress after veraison during mid-August and early September (Figure 2⇑). During the postharvest recovery period (at 45% ETc), vine water status recovered faster than gas exchange in RDI, with no significant differences observed in Ψs, between 15 and 21 days after recovery depending on the year (Figure 2A, B⇑). In 2006, gs in RDI-2 vines was significantly lower than in control and RDI-1 vines 17 days after recovery. Similarly, in 2007, nearly full recovery was observed in RDI-1, only 6% lower A than the control. However, A did not recover completely in RDI-2 vines. Intrinsic (A/gs) and instantaneous water use efficiency (A/E) increased with water stress to reach a maximum A/gs (91 μmol mol−1) at −1.4 MPa of Ψs and 0.11 mol m−2 s−1 of gs and a maximum A/E at −1.3 MPa and 0.14 mol m−2 s−1 (Figure 3A, C, D, E⇓). Below these threshold values, leaf gas exchange efficiency did not increase or dropped slightly. When gs was <0.05 mol m−2 s−1 as a consequence of severe water stress, A/gs decreased sharply due to a strong decline in A for small changes in gs (Figure 3B⇓). Moreover, the relationships between gs and Ψs and A and Ψs pre- and postveraison also suggested early and progressive stomatal closure as Ψs decreased, with a threshold of approximately -1.1 MPa, above which photosynthesis was not clearly affected (Figure 3F, G⇓). Below -1.1 MPa, stomatal closure intensified, with a subsequent decrease in photosynthesis. In both years, A and gs showed a typical exponential relationship of A = 19.4 * (1 − e−6.3gs) (p < 0.001; r = 0.95) (Figure 4⇓).
. (F) Relationship between midday Ψs and midmorning gs (gs = 0.43 + 0.22 Ψs) and (G) midmorning leaf photosynthesis rate (A) during postveraison period (A = 16.3/1 + e(−(Ψs − (−1.5))/0.25)). Horizontal and vertical dashed lines indicate different threshold values. Maximum values ranges of different indicators were calculated using the equations. Measurements were taken pre- and postveraison, June–Sept 2007. Relationship between photosynthesis (A) and stomatal conductance (gs) (linear, A = 4.23 + 48.5gs, r = 0.94, p < 0.001; exponential, A = 19.4(1 − e(−6.29gs)), r = 0.95, p < 0.001). Each value is the mean per plot calculated before and after veraison (early June–end Sept) for each treatment in the two years. Leaf chlorophyll decreased significantly more during postveraison in RDI-2 vines than in 0control and RDI-1 vines (Table 4⇓). Leaf nitrogen decreased significantly in both RDI treatments pre- and postveraison. Thus, photosynthetic nitrogen use efficiency (NUEph) decreased in the two RDI treatments compared to the control, and RDI-2 also had significantly lower NUEph than RDI-1. Mean leaf chlorophyll and photosynthetic nitrogen use efficiency (NUEph) for different treatments, pre- and postveraison, 2006 to 2007. Leaf area development and cluster microclimate. Leaf area reached a maximum of >6 m2 vine−1 at the end of June, and no significant differences were observed in leaf area among treatments (Figure 5⇓). Following veraison, total leaf area per vine was significantly higher in the control than in RDI-1 and RDI-2. These differences were mainly due to differences in the main shoot leaf area, since lateral leaf area between treatments was similar. From June to early August, the leaf area of the main shoots was reduced by 14% and 19% in RDI-1 and RDI-2, respectively, compared with only 2% in control vines. In this period, lateral leaf area was reduced between 3% and 5% in the RDI treatments. Development of total leaf area (A), main leaf area (B), and lateral leaf area (C) per vine at four representative times in 2007. Vertical bars represent the standard error of the mean. Each point is the average of 16 measurements. After veraison, the reduction in leaf area during ripening (early August up to the end of September) was due mainly to intense leaf abscission and leaf senescence in RDI vines. During postveraison, the main leaf area was reduced by 38% and 51% in RDI-1 and RDI-2, respectively, compared to only 19% in control vines (Figure 5B, C⇑). Lateral leaf area was reduced by 26% in RDI-1 and 38% in RDI-2 compared with only 13% in the control. Consequently, cluster zone microclimate was clearly altered by irrigation via alterations in leaf area (Figure 6A, B⇓). The lowest incident PAR values at the cluster zones were in control vines (Figure 6C⇓). Moreover, the morning berry temperatures of internal clusters were significantly greater in berries from RDI vines than from control vines (Figure 6D⇓). (A) Mean total leaf area and mean berry temperature in non-sun-exposed bunches, July–Sept 2007. Each point is a single measurement per vine. (B) Mean total leaf area and photosynthetically active radiation (PAR) in fruiting positions, July–Sept 2007. Each point is a single measurement per vine. (C) Evolution (morning) of PAR in fruiting positions for each treatment, postveraison Aug 2006–2007. Each point is the average of 12 measurements/treatment. (D) Evolution (morning) of berry temperature in non-sun-exposed bunches (inside canopy) for each treatment, preveraison July 2006–2007. Each point is the average of 20 measurements/treatment. In C and D, vertical bars represent standard error of the mean. Yield response and berry quality–vine physiology relationships. Yield (kg vine−1) was significantly reduced by RDI treatments compared to the control in the two years. Mean yield reductions in RDI-1 and RDI-2 were 31% and 44%, respectively (Table 5⇓). Berry weight was an important yield component affected in both years, with a mean reduction of ~24% for RDI-1 and a greater reduction of ~37% for RDI-2 compared to the control. This was also reflected in lower cluster weights in RDI-2, but not in significant differences in berry number per cluster. Also a slight, but significant, decrease was observed in cluster number per vine between control and RDI treatments, but not between RDI treatments. Yield response for each treatment, 2006 and 2007. Total soluble solids (TSS) (as Brix) were significantly reduced in RDI berries (Table 6⇓). There was a close relationship between A and Ψs postveraison and Brix at harvest (Figure 7A, B⇓). In both years, malic acid decreased significantly in the RDI treatments (Table 6⇓). Other compositional measures, such as juice pH, were not clearly affected by irrigation treatments. In 2006, no significant differences among treatments in total and extractable anthocyanin concentration were observed. However, in 2007 there was a significant increase in total and extractable anthocyanins for RDI-1 and RDI-2 at harvest. In both years, polyphenol concentrations were significantly higher in the RDI treatments, and in 2007 concentrations were significantly higher in RDI-1 than in RDI-2. Extractable anthocyanin and polyphenol concentration increased with greater water stress postveraison until reaching a maximum at the Ψs threshold, −1.35 to −1.4 MPa (Figure 7C, D⇓). Below these values, anthocyanin and polyphenol concentration did not increase substantially or even decreased. Moreover, the maximum polyphenol concentration reached just after veraison (data not shown) linearly correlated with the Ψs maintained during preveraison (Figure 7E⇓). However, the decreased polyphenol observed postveraison, mainly during August (data not shown), also closely correlated with the degree of water stress postveraison (Figure 7F⇓). Berry composition parameters at harvest, 2006 and 2007.
. (E) Preveraison midday Ψs and extractable polyphenols just after veraison: polyext = −68.9 − 126.9 Ψs. (F) Postveraison (Aug–early Sept) midday Ψs and % reduction of extractable polyphenols: %reducpolyext = −27.9 − 46.1 Ψs. In A–E, each point is the average of one plot for 2006 and 2007. Thresholds and maximum values calculated using the equations. Vertical and horizontal dashed lines represent different threshold values proposed. Root-leaf function and physiological threshold levels under RDI. The linear relationships between Kroot-stem and Kplant, and Ψs suggest that plant hydraulic conductance and root water uptake were progressively reduced during water stress (Figure 1⇑, Table 3⇑). Previous experiments reported that water stress decreases whole-plant hydraulic conductivity in grapevines (Lovisolo and Schubert 1998), in proportion to increased soil water deficit (Schultz 2003). The greater reduction in Kroot-stem and Kplant observed in RDI-2 postveraison indicates less water supply to shoots, explaining in part the lower vine water status compared to RDI-1 (Figure 2A and 2B⇑). It is well known that water deficits reduce the capacity of roots to take up water (Steudle 2000). The significant decrease in leaf nitrogen observed in RDI-1 and RDI-2 during pre- and postveraison, but not during the well-irrigated period (April-May) (data not shown), could indicate reduced N uptake in deficit-irrigated treatments as a consequence of soil water deficit. Nutrient uptake becomes increasingly difficult for drought-stressed grapevines (Conradie 2005), especially if the water deficit is sufficient to slow root growth (Keller 2005). The significantly lower leaf N, leaf chlorophyll, and NUEph, mainly during postveraison in RDI-2 (Table 4⇑), indicated quantitative losses in the photosynthetic apparatus and/or damage to the biochemical photosynthetic machinery, decreasing photosynthetic capacity. Moreover, long-term photosynthetic capacity was also reduced in RDI-2 compared to RDI-1. 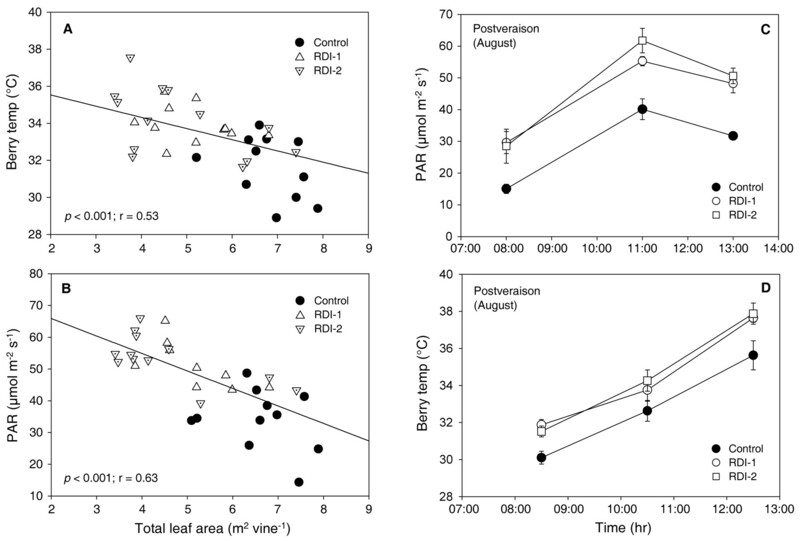 This was confirmed by the lower leaf N (data not shown) and significantly lower midmorning A maintained postharvest (mid-September–October) in 2007 in RDI-2 vines (Figure 2C and 2D⇑), possibly indicating earlier leaf senescence (Schreiner et al. 2006). Analysis of seasonal leaf gas exchange and the relationships among gs, A, and Ψs indicated that stomatal closure in response to water stress occurred before detectable changes in Ψs or RWC (Figure 2⇑, Figure 3F, G⇑). This suggests that gs is a more precise and sensitive indicator of water stress than Ψs and RWC, or even 𝛉v, when mild or moderate soil water deficit was applied under RDI (Cifre et al. 2005). Moreover, gs was more sensitive to mild to moderate water stress (Ψs > −1.2 MPa) than A. As a consequence, in pre- and postveraison periods there was a significant increase in gas exchange efficiency, A/gs, and A/E in RDI vines when Ψs was between −1.3 and 1.4 MPa and when gs was between 0.11 and 0.14 mol m−2 s−1, as has been shown previously (Costa et al. 2007). The analysis of the changes in the slope of the A/gs relationship (plotting all data of the two years) showed three different water use efficiency regions (Figure 4⇑). In region 1, gs > 0.15 mol m−2 s−1 did not exhibit a substantial improvement in photosynthesis compared to gs while E (water consumption), and gas exchange efficiency started to decrease (ΔA/Δgsexp < ΔA/Δgs linear or ΔA/Δgsexp − ΔA/Δgs linear < 0). This stomatal behavior corresponds with phase 1 of the photosynthesis response shared by different grapevine cultivars (Flexas et al. 2002). At this stage, stomatal closure is probably the only limitation on photosynthesis, with a progressive increase in A/gs (Cifre et al. 2005). In our study, mean gs > 0.15 mol m−2 s−1 at midmorning was maintained only in the control treatment during preveraison in 2006 and the entire pre- and postveraison in 2007 (Figure 2E, F⇑), indicating less plant water use efficiency than the RDI treatments. 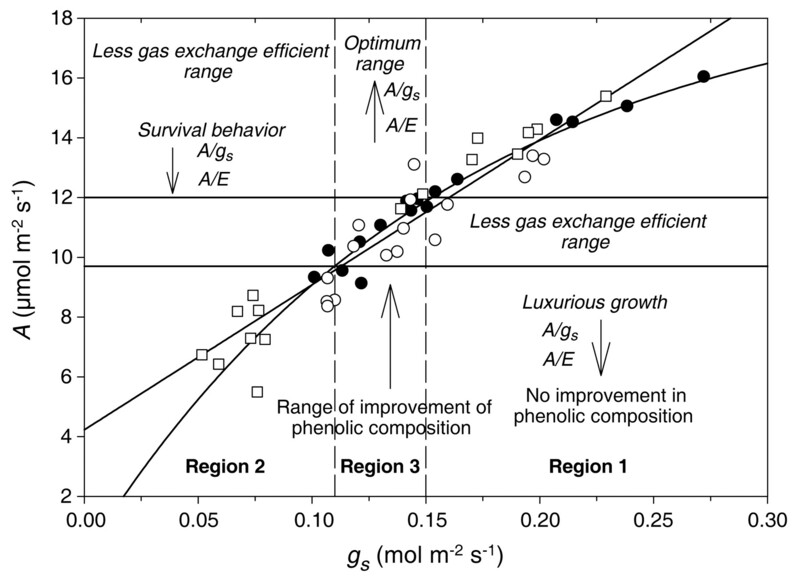 In region 2, to maintain gs less than or equal to 0.11 mol m−2 s−1, vines did not exhibit improved gas exchange efficiency (Figure 4⇑). Under these conditions, A decreased proportionally more than E and gs (ΔA/Δgsexp > ΔA/Δgs linear or ΔA/Δgsexp − ΔA/Δgs linear > 0.10). Moreover, the relationships between gs and A/gs at midday during mid-August–early September, the period of greatest water stress, also showed a drastic decrease in A/gs at gs < 0.05 mol m−2 s−1 and Ψs < −1.7 MPa) (Figure 3B, F⇑), which coincided also with an increase in intercellular CO2 concentration (Ci)(data not shown). This stomatal response coincided with phase 3 of severe water stress: gs < 0.05 mol m−2 s−1 as reported (Flexas et al. 2002, 2004). In region 3, according to our data, gs between 0.12 and 0.15 mol m−2 s−1 (ΔA/Δgsexp > ΔA/Δgs linear or 0 < ΔA/Δgsexp − ΔA/Δgs linear < 0.10) would increase leaf water use efficiency (up to 86–89 μmol mol−1) without having a detrimental effect on A, maintaining rates between 10 and 12 μmol m−2 s−1 during pre- and postveraison (Figure 4⇑). This stomatal behavior (with a slight shift) corresponds to phase 2 of moderate water stress, as proposed (Flexas et al. 2002). These results suggest that intermediate gs values could be used as physiological indicators to improve vine water use efficiency in Monastrell grapevines under semiarid conditions (Table 7⇓). Threshold ranges for optimum and dangerous water stress proposed for pre- and postveraison in RDI Monastrell grapevines to avoid severe damage in root and leaf function and to improve berry quality under these edaphoclimatic conditions. Mean values of different physiological indicators maintained pre- (early June–end July) and postveraison (Aug–mid-Sept) in 2007. Microclimate in the cluster zone was clearly altered by RDI, as it reduced canopy leaf area (Figure 6A, B⇑). Intense leaf abscission during postveraison severe water stress increased fruit sunlight exposure in RDI treatments, as reported in Shiraz grapevines (Ginestar et al. 1998a). The degree of defoliation was closely correlated with the severity of water stress postveraison (data not shown), as previously observed (Ginestar et al. 1998a, Wample and Smithyman 2002). In warm, semiarid growing regions such as Jumilla, increased cluster exposure to direct solar radiation as a consequence of reduced leaf area increases cluster temperature and explains the increased malic acid degradation under RDI (Ginestar et al. 1998b). Greater cluster exposure under RDI increased color intensity and anthocyanin and polyphenol content above control vines, confirming previous studies (Santos et al. 2005, 2007). These results are in accordance with the increased anthocyanins and other phenolic compounds found in berries of vines subjected to water deficit and different edaphoclimatic conditions (Ginestar et al. 1998b, Kennedy et al. 2002, Castellarin et al. 2007a, 2007b). The differences in phenolic composition between RDI-1 and RDI-2 (mainly in 2007) cannot be explained by changes in the cluster environment, as significant differences in canopy exposure between RDI-1 and RDI-2 were not found. The positive correlation between A during postveraison and TSS at harvest (Figure 7A⇑) indicates that the low total soluble solids under RDI can be explained by low carbohydrate accumulation in the berries postveraison. This likely resulted from lower A compared to the control and reduced leaf area as a consequence of intense leaf abscission. Reduced seasonal and daily CO2 assimilation and more intense leaf abscission during ripening in RDI-2 as a consequence of more severe water stress would explain the lower sugar accumulation in theses berries compared to RDI-1 (Table 6⇑). Sugar concentration seems to be related to functional leaf area available for fruit growth (Mabrouk and Sinoquet 1998) and decreased A and sugar export from the leaves under severe water stress reducd berry sugar accumulation (Keller 2005, Conde et al. 2007). The relationships between TSS and A and between TSS and midday Ψs (Figure 7A, B⇑) suggest that by maintaining Ψs at −1.3 MPa and A at ~10.5 to 12 μmol m−2 s−1 during postveraison (Table 4⇑), Brix could be 22.5 to 23 at harvest, which is appropriate for red wine production in the Jumilla region. Moreover, the close linear relationship between midday Ψs and leaf area reduction postveraison (data not shown) suggests that these threshold values should be maintained (though not exceeded) to reduce the intense leaf abscission during ripening. Reduced berry size in RDI-2 (15–18% lower than in RDI-1) and consequent lower yields (Table 5⇑) did not improve phenolic composition compared to RDI-1 in either year (Table 6⇑). The lower leaf area development and crop load in 2006 (1.02 and 1.12 m2/kg in RDI-1 and RDI-2, respectively) compared to 2007 (1.55 and 1.51 m2/kg in RDI-1 and RDI-2, respectively) and the lower gas exchange rates postveraison (exceeding the proposed threshold limits) in both RDI treatments in 2006 (Figure 2⇑) could explain the similar anthocyanin concentrations in 2006 (Table 6⇑). In 2007, the RDI-1 treatment had more extractable polyphenols and anthocyanins than RDI-2. The combination of intense leaf abscission and substantially decreased photosynthetic capacity in RDI-2 vines likely resulted in decreased accumulation of all metabolites, primary (sugars and organic acids) and secondary (flavonoids), as suggested elsewhere (Downey et al. 2006, Joscelyne et al. 2007). The relationships between several physiological measures and polyphenolic concentrations allowed for calculation of physiological thresholds for improved phenolic composition of Monastrell berries at harvest. Moderate preveraison water stress as reached in 2007 in RDI-1 (mean Ψs = −1.21 MPa, gs = 0.15 to 0.16 mol m−2 s−1) and even in RDI-2 (Ψs = −1.23 MPa, gs = 0.13 to 0.14 mol m−2 s−1) were within the range proposed to increase A/gs without substantially affecting soil water status, root function, and leaf function (gas exchange and chlorophyll content) (Table 7⇑). Total polyphenol increased just after veraison as a consequence of moderate preveraison water stress, compared to well-irrigated vines (Figure 7E⇑), without negatively impacting other berry quality measures. Similarly, a preveraison leaf water potential of −1.3 MPa is associated with beneficial yield and berry quality attributes (Shellie 2006). Midday Ψs of approximately −1.3 to −1.4 MPa postveraison (but never Ψs ≤ −1.4 MPa) and midmorning gs between 0.14 and 0.12 mol m−2 s−1 maintained high leaf photosynthetic capacity and increased anthocyanin and polyphenol concentrations at harvest (Figure 3F⇑, Figure 7C, D⇑). These gs values were also associated with mean levels of midmorning A >10 μmol m−2 s−1 (11.4 to 10 μmol m−2 s−1) (Figure 4⇑) and with maximum A/E approximately 4 μmol mmol−1 and A/gs approximately 90 μmol mol−1 (stage 2 of moderate water stress proposed by Flexas et al. 2002). Maintaining A, gs, and Ψs within the optimum range and above the threshold values presented (Table 7⇑) would also avoid drastic decreases in extractable polyphenols and sugar accumulation postveraison. The moderate water stress applied in RDI-1 maintained adequate soil water to sustain vine water status and gas exchange within the range of optimum threshold values. This increased fruit sugar content and phenolic composition at harvest compared with well-watered or control vines. However, RDI-2 suffered higher stress, mainly postveraison, when the proposed threshold values were clearly exceeded. The severe water stress substantially reduced soil water, root function (reducing root-plant hydraulic conductivity), and leaf gas exchange (decreasing A, leaf N and chlorophyll, and NUEph). Moreover, excessive water stress postveraison produced excessive leaf abscission, reducing leaf area development and yield. 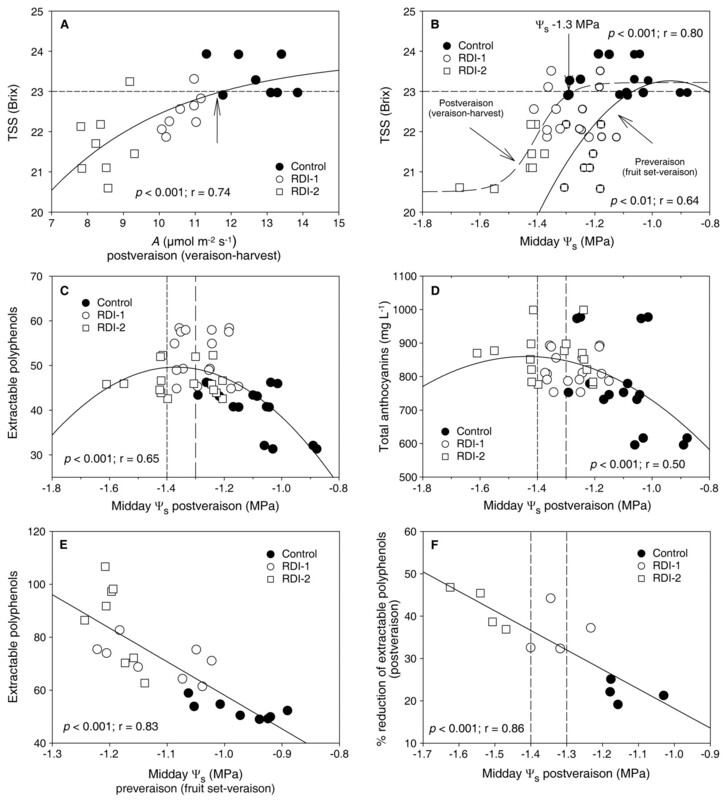 Lower A and greater leaf abscission significantly decreased sugar, malic acid, polyphenols, and anthocyanins in RDI-2 berries compared to RDI-1. Acknowledgments: This work was financed by the Instituto Nacional de Investigación y Tecnología Agraria y Alimentaria (INIA), Subprograma Nacional de Recursos y Tecnologías Agrarias through Project RTA2005-00103-00-00 in collaboration with the Fondo Social Europeo. The authors thank Atanasio Molina Molina and Aniceto Turpín Bermejo for cooperation in vineyard management, Juan Jose García Sánchez and Jose María Rodriguez de Vera-Beltrí for field assistance and support with lab analysis, José Sáez Sironi for the N determinations, and Michael Thomlinson for assistance with manuscript preparation. Allen, R.G., L.S. Pereira, D. Raesk, and M. Smith. 1998. Crop Evapotranspiration Guidelines for Computing Crop Water Requirements. Irrigation and Drainage Paper No 56. FAO, Rome. Baeza, P., P. Sánchez-de-Miguel, A. Centeno, P. Junquera, R. Linares, and J.R Lissarrague. 2007. Water relations between leaf water potential, photosynthesis and agronomic vine response as a tool for establishing thresholds in irrigation scheduling. Sci. Hortic. 114:151–158. Castellarin, S.D., M.A. Matthews, G.D. Di Gaspero, and G.A. Gambetta. 2007a. Water deficits accelerate ripening and induce changes in gene expression regulating flavonoid biosynthesis in grape berries. Planta 227:101–112. Castellarin, S.D., A. Pfeiffer, P. Sivilotti, M. Degan, E. Peterlunger, and G. Di Gaspero. 2007b. Transcriptional regulation of anthocyanin biosynthesis in ripening fruits of grapevine under seasonal water deficit. Plant Cell Environ. 30:1381–1399. Chaves, M.M., T.P. Santos, C.R. Souza, M.F. Ortuño, M.L. Rodrigues, C.M. Lopes, J.P. Maroco, and J.S. Pereira. 2007. Deficit irrigation in grapevine improves water-use efficiency while controlling vigour and production quality. Ann. Appl. Biol. 150:237–252. Cifre, J., J. Bota, J.M. Escalona, H. Medrano, and J. Flexas. 2005. Physiological tools for irrigation scheduling in grapevine (Vitis vinifera L.). An open gate to improve water use efficiency? Agric. Ecosyst. Environ. 106:159–170. Conde, C., P. Silva, N. Fontes, A.C.P. Dias, R.M. Tavares, M.J. Sousa, A. Agasse, S. Delrot, and H. Gerós. 2007. Biochemical changes throughout grape berry development and fruit and wine quality. Food 1:1–22. Conradie, W.J. 2005. Partitioning of mineral nutrients and timing of fertilizer applications for optimum efficiency. In Proceedings of the Soil Environment and Vine Mineral Nutrition Symposium. P. Christensen and D.R. Smart (eds. ), pp. 69–81. Am. Society for Enology and Viticulture, Davis. Cortell, J.M., M. Halbleib, A.V. Gallagher, T.L. Righetti, and J.A. Kennedy. 2005. Influence of vine vigor on grape (Vitis vinifera L. cv. Pinot noir) and wine proanthocyanidins. J. Agric. Food Chem. 53:5798–5808. Cortell, J.M., M. Halbleib, A.V. Gallagher, T.L. Righetti, and J.A. Kennedy. 2007. Influence of vine vigor on grape (Vitis vinifera L. cv. Pinot noir) anthocyanins. 2. Anthocyanins and pigmented polymers in wine. J. Agric. Food Chem. 55:6585–6595. Costa, J.M., M.F. Ortuño, and M.M. Chaves. 2007. Deficit irrigation as a strategy to save water: Physiology and potential application to horticulture. J. Integr. Plant Biol. 49:1421–1434. Fereres, E., and R.G. Evans. 2006. Irrigation of fruit trees and vines: An introduction. Irrig. Sci. 24:55–57. Flexas, J., J. Bota, J.M. Escalona, B. Sampol, and H. Medrano. 2002. Effects of drought on photosynthesis in grapevines under field conditions: An evaluation of stomatal and mesophyll limitations. Funct. Plant Biol. 29:461–471. Flexas, J., et al. 2004. Understanding down-regulation of photosynthesis under water stress: Future prospects and searching for physiological tools for irrigation management. Ann. Appl. Biol. 144:273–283. Ginestar, C., J. Eastham, S. Gray, and P. Iland. 1998a. Use of sap-flow sensors to schedule vineyard irrigation. I. Effects of post-veraison water deficits on water relations, vine growth, and yield of Shiraz grapevines. Am. J. Enol. Vitic. 49:413–420. Ginestar, C., J. Eastham, S. Gray, and P. Iland. 1998b. Use of sap-flow sensors to schedule vineyard irrigation. II. Effects of post-veraison water deficits on composition of Shiraz grapes. Am. J. Enol. Vitic. 49:421–428. Inskeep, W., and P.R. Bloom. 1985. Extinction coefficients of chlorophyll a and b in N,N-dimethylformamide and 80% acetone. Plant Physiol. 77:483–485. Jones, H.G. 2004. Irrigation scheduling: Advantages and pitfalls of plant-based methods. J. Exp. Bot. 55:2427–2436. Jones, H.G. 2007. Monitoring plant and soil water status: Established and novel methods revisited and their relevance to studies of drought tolerance. J. Exp. Bot. 58:119–130. Joscelyne, V.L., M.O. Downey, M. Mazza, and S.E.P. Bastian. 2007. Partial shading of Cabernet Sauvignon and Shiraz vines altered wine color and mouthfeel attributes, but increased exposure had little impact. J. Agric. Food Chem. 55:10888–10896. Keller, M. 2005. Deficit irrigation and vine mineral nutrition. Am. J. Enol. Vitic. 56:267–283. Keller, M., R.P. Smithyman, and L.J. Mills. 2008. Interactive effects of deficit irrigation and crop load on Cabernet Sauvignon in an arid climate. Am. J. Enol. Vitic. 59:221–243. Kennedy, J.A., M.A. Matthews, and A.L. Waterhouse. 2002. Effect of maturity and vine water status on grape skin and wine flavonoids. Am. J. Enol. Vitic. 53:268–274. Kriedemann, P.E., and I. Goodwin. 2003. Regulated deficit irrigation and partial root-zone drying. An overview of principles and applications. Irrigation Insights No. 4. Land and Water Australia, Canberra. Lo Gullo, M.A., S. Salleo, R. Rosso, and P. Trifilò. 2003. Drought resistance of 2-year-old saplings of Mediterranean forest trees in the field: Relations between water relations, hydraulics and productivity. Plant Soil 250:259–272. Lovisolo, C., and A. Schubert. 1998. Effects of water stress on vessel size and xylem hydraulic conductivity in Vitis vinifera L. J. Exp. Bot. 49:693–700. Mabrouk, H., and H. Sinoquet. 1998. Indices of light microclimate and canopy structure of grapevines determined by 3D digitising and image analysis, and their relationship to grape quality. Aust. J. Grape Wine Res. 4:2–13. McCarthy, M.G., B.R. Loveys, P.R. Dry, and M. Stoll. 2002. Regulated deficit irrigation and partial root zone drying as irrigation management techniques for grapevines. In Deficit Irrigation Practices. FAO Water Reports No. 22, pp. 79–87. FAO, Rome. Nardini, A., and S. Salleo. 2000. 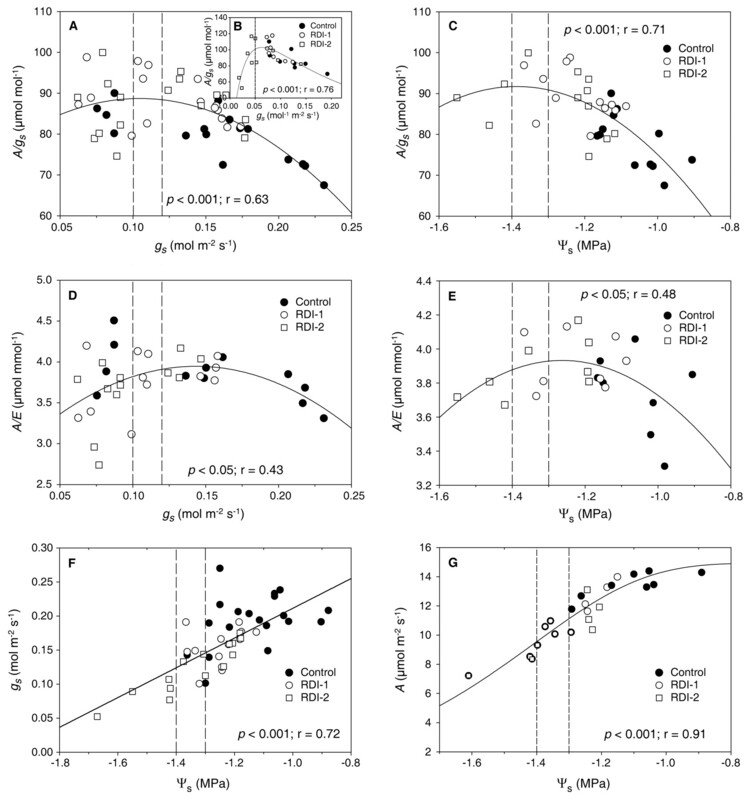 Limitation of stomatal conductance by hydraulic traits: Sensing or preventing xylem cavitation? Trees 15:14–24. Richter, H. 1997. Water relations of plants in the field: Some comments on the measurement of selected parameters. J. Exp. Bot. 48:1–7. Rose, S., S. Groves, and R. Bailey. 2001. Calibration of a capacitance sensor for soil water measurement. UK Irrig. 29:17–19. Saint-Cricq, N., N. Vivas, and Y. Glories. 1998. Maturité phénolique: Définition et côntrole. Rev. Franc. Oenol. 173:22–25. Santos, T.P., C.M. Lopes, M.L. Rodrigues, C.R. de Souza, J.M. Ricardo-da-Silva, J.P. Maroco, J.S. Pereira, and M.M. Chaves. 2005. Effects of partial root-zone irrigation on cluster microclimate and fruit composition of field-grown Castelao grapevines. Vitis 44:117–125. Santos, T.P., C.M. Lopes, M.L. Rodrigues, C.R. de Souza, J.M. Ricardo-da-Silva, J.P. Maroco, J.S. Pereira, and M.M. Chaves. 2007. Effects of deficit irrigation strategies on cluster microclimate for improving fruit composition field-grown grapevines. Sci. Hortic. 112:321–330. Schreiner, P.R., C.F. Scagel, and J. Baham. 2006. Nutrient uptake and distribution in a mature ‘Pinot noir’ vineyard. HortScience 41:336–345. Schultz, H.R. 2003. Differences in hydraulic architecture account for near-isohydric and anisohydric behaviour of two field-grown Vitis vinifera L. cultivars during drought. Plant Cell Environ. 26:1393–1405. Shellie, K.C. 2006. Vine and berry response of Merlot (Vitis vinifera L.) to differential water stress. Am. J. Enol. Vitic. 57:514–518. Sousa, T.A., M.T. Oliveira, and J.M Pereira. 2006. Physiological indicators of plant water status of irrigated and non-irrigated grapevines grown in a low rainfall area of Portugal. Plant Soil 282:127–134. Steudle, E. 2000. Water uptake by roots: Effects of water deficit. J. Exp. Bot. 51:1531–1542. Tsuda, M., and M.T. Tyree. 2000. Plant hydraulic conductance measured by the high pressure flow meter in crops plants. J. Exp. Bot. 51:823–828. Wample, R.L., and R. Smithyman. 2002. Regulated deficit irrigation as a water management strategy in Vitis vinifera production. In Deficit Irrigation Practices. FAO Water Reports No. 22, pp. 89–100. FAO, Rome.